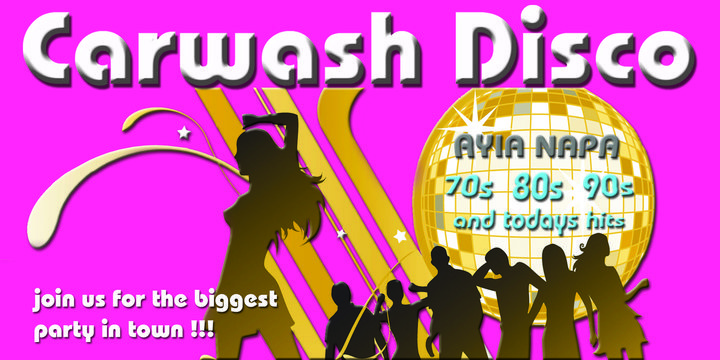 Carwash Disco was born in Ayia Napa in August 1996. Since then it's party atmosphere has been drawing crowds ever since. With a music policy of 70's and 80's and 90's music as well as cheesy party hits of more recent years, this is the place to dance on the bar, strut your stuff on the dance floor and generally let your hair down. Carwash is not the place to worry about looking cool! All nationalities and ages come together here to shake their stuff. Singing, dancing, arm waving and joining in are pretty much obligatory.